More and more often – coinciding with the increased level of atheism amongst the general population – you read the patently absurd claim along the lines of “atheism is just a new religion” or “to be an atheist requires even more faith than being religious”. Similarly, with the advent of vocal (“new”) atheists, the most famous of which are the “Four Horsemen” Richard Dawkins, Christopher Hitchens, Daniel Dennett and Sam Harris, you read things like “oh those atheists are just as dogmatic as fundamentalists – unlike us, the normal believers”. Well… crap. It’s just plain rubbish. I could (might, will) write more and longer about this subject, because it offends me – it says stuff about me that is untrue, and I can’t stand that. This is a very easy one to dismiss – so easy that it’s hard to believe anybody can still seriously offer it up. Dogma in the context of religion – which is what we’re talking about here – is a set of doctrines and principles handed down as fixed and true by the authorities. Well, first off there are no atheist authorities to hand anything down, there are no atheist “followers” to hand anything down to, and there is no higher power in atheism to give any credence to such claims either. Second, nothing is fixed in the context of atheism. Atheism (well this is my take on it at least) is the position that, given the lack of evidence, the likelihood of any god/supernatural power existing is so small as to be insignificant to reckon with in day-to-day matters. That evidence bit is important. If any sort of god were to provide convincing evidence, I would immediately change my position. How dogmatic is that? It is not. Convincing evidence should not be hard to provide by any sort of god worth his/her/its salt, being powerful and all that. I’m not talking about a five-thousand-year-old story of a talking bush-on-fire; I’m talking “turning Mt Everest upside it’s head and planting it on the moon” kind of stuff. Well… the absence by definition of any supernatural entity again makes you wonder how people can make this claim. Even other, more casual, comparisons don’t hold any water. Communism and suchlike political systems have many characteristics of religions. Atheism lacks these, too. No infallible leader who can’t be criticised; no party doctrine to which must be adhered; no flags or country to swear allegiance to. Nothing of the sorts. There is also a total absence of any organised atheism; no atheist “church” buildings, atheist clergy, atheist “holy books”. Again, nothing at all. Atheism only superficially resembles a religion if you want to equate a religion with something (perhaps a way of life or a philosophical position) that people talk about, feel strongly about, and try to convince others of being right. But if that is so, then vegetarianism and veganism, the belief in universal suffrage, freedom of speech, &c, are also “religions”. 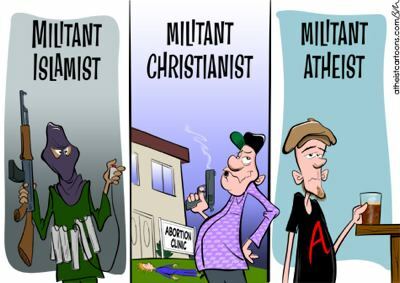 In fact, people believing in the latter throughout history have often been more violent/militant in pursuing their cause than atheists have been, making these more like religion than atheism. Fortunately, less and less people subscribe to the truly and properly dogmatic institutions that are organised religions. So, in time, us atheists will have to read less and less of these weird, rearguard actions type of writings by scared (rightly so, but for the wrong reasons) and uninformed (or just cynically manipulative) believers. Then, we will be truly free to not-believe. To make myself feel even better on my birthday, I donated £15,- to the atheist bus campaign. Just because I can. Get those buses rolling!